Fast disintegrating tablets (FDTs) have received ever-increasing demand during the last decade, and the field has become a rapidly growing area in the pharmaceutical industry. Oral drug delivery remains the preferred route for administration of various drugs. Recent developments in the technology have prompted scientists to develop FDTs with improved patient compliance and convenience. Upon introduction into the mouth, these tablets dissolve or disintegrate in the mouth in the absence of additional water for easy administration of active pharmaceutical ingredients. The popularity and usefulness of the formulation resulted in development of several FDT technologies. FDTs are solid unit dosage forms, which disintegrate or dissolve rapidly in the mouth without chewing and water. FDTs or orally disintegrating tablets provide an advantage particularly for pediatric and geriatric populations who have difficulty in swallowing conventional tablets and capsules. This review describes various formulations and technologies developed to achieve fast dissolution/dispersion of tablets in the oral cavity. In particular, this review describes in detail FDT technologies based on lyophilization, molding, sublimation, and compaction, as well as approaches to enhancing the FDT properties, such as spray drying and use of disintegrants. In addition, taste-masking technologies, experimental measurements of disintegration times, and dissolution are also discussed. Fast disintegrating tablets (FDTs) are meant for administration to the patients who cannot swallow, such as the elderly, stroke victims, bedridden patients, patients affected by renal failure, and patients who refuse to swallow, such as pediatric, geriatric, and psychiatric patients. By the use of FDTs, rapid drug therapy intervention can be achieved, achieve increased bioavailability/rapid absorption through pregastric absorption of drugs from mouth, pharynx, and esophagus as saliva passes down. FDTs are convenient for administration and patient compliant for disabled, bedridden patients, and for travelers and busy people who do not always have access to water. Their good mouth feel property helps to change the perception of medication as bitter pill, particularly in pediatric patients. The risk of chocking or suffocation during oral administration of conventional formulations due to physical obstruction is avoided, thus providing improved safety. The new business opportunity like product differentiation, product promotion, patent extension, and life cycle management become easy after the intervention of FDTs. The FDTs are often formulated for existing drugs with an intention to extend the patent life of the drug through product differentiation. For the ideal FDT technology, the drug properties should not significantly affect the tablet property. 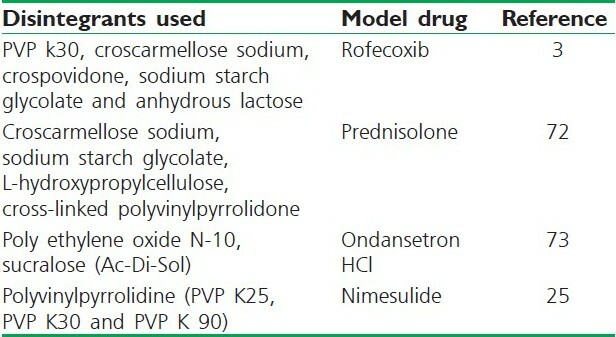 Many drug properties could potentially affect the performance of FDTs. For example, the solubility, crystal morphology, particle size, hygroscopicity, compressibility, and bulk density of a drug can significantly affect the final tablet's characteristics, such as tablet strength and disintegration. The FDT technology should be versatile enough to accommodate unique properties of each drug. The drugs belonging to Biopharmaceutical Classification System Class II, i.e., the drugs with poor solubility and high permeability are best suitable moieties for FDTs in a dose of 125 and 250 mg. , Tizanidine HCl,  Oxybutynin HCl,  Rofecoxib,  Ibuprofen,  Promethazine Theoclate,  prednisone,  Indomethacin,  Glyburide,  Fentanyl citrate,  Griseofulvin,  Hydrochlorothiazide,  Crystallized Paracetamol,  and Nimesulide  are few examples of drugs that has been formulated as fast-dissolving drug delivery system. The fabrication of lyophilized FDTs is based on creating a porous matrix by subliming the water from pre-frozen aqueous formulation of the drug containing matrix-forming agents and other excipients such as lyoprotectants, preservatives, and flavors. The FDTs comprise of two component frameworks of lyophilized matrix system that work together to ensure the development of a successful formulation. The first component is water-soluble polymers such as gelatin, dextran, alginate,  and maltodextrin. This component maintains the shape and provides mechanical strength to the tablets (binder). The second constituent is matrix-supporting/disintegration-enhancing agents such as sucrose and mannitol, which acts by cementing the porous frame work, provided by the water-soluble polymer and accelerates the disintegration of the FDT. Although there is wide availability of literature describing the preparation of RDTs by lyophilization, the number of matrix-supporting/disintegration-enhancing agents used has been limited to saccharides and polyols, with majority of the work dedicated to the inclusion of mannitol. , This is primarily because the incorporation of these matrix-forming agents requires fulfillment of stringent characteristics such as reasonable drying time, stability during freeze-drying process, as well as formation of elegant tablets with short disintegration time and adequate mechanical properties. Zydis technology (ZT) is a patented technique. ZT utilizes a unique freeze-drying process to manufacture finished dosage units which significantly differ from conventional oral systems. In this technology, the solution or suspension of drug in water is poured in preformed blisters (providing shape to the tablet) and passing them to a specially designed cryogenic freezing process to control the size of ice crystals which ensures that the tablet is having porous matrix for rapid disintegration. 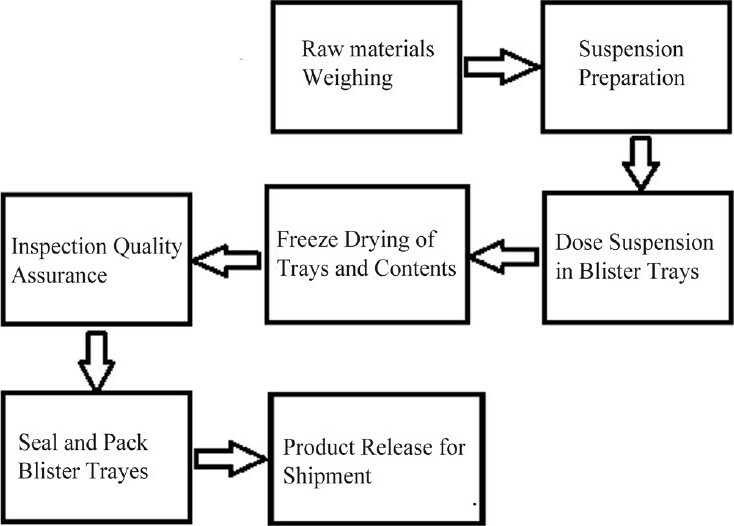 Then, these frozen units are then transferred to large-scale freeze dryers for the sublimation process, where the majority of the remaining moisture is removed from the tablets and open blisters are packed using a heat seal process (steps involved in freeze-drying process [Figure 1]). Figure 1: Zydis® tablet manufacturing process. In Quicksolv porous solid dosage forms are obtained by freezing an aqueous dispersion/solution of the drug-containing matrix and then drying it by removing the water using excess of alcohol by solvent extraction. The final form disintegrates very rapidly, but is limited to low drug content and can be used only for those drugs that are insoluble in the extraction solvent. The ideal drug characteristics required for this technology are relative low aqueous solubility, fine particle size <50 μm,  and good aqueous stability in the suspension. Tablets having great mouth feel due to fast melting effect. 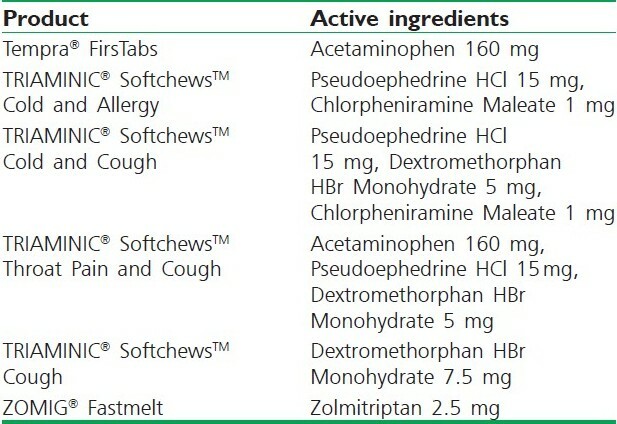 Direct compression is the simplest and most cost-effective tablet manufacturing technique for Mouth Dissolving Tablets (MDT) as they can be fabricated using conventional tablet manufacturing and packaging machinery and also due to availability of tableting excipients with improved flow, compressibility, and disintegration properties. Orasolv [Figure 2] is also a patented technology. Orasolv tablet are lightly compressed and are weaker and more brittle than the conventional tablets. CIMA LABS develops a special handling and packaging system for Orasolv. An advantage of low degree of compaction is that the particle coating used for taste masking is not compromised by fracture during compression. Figure 2: Typical OraSolv® package. Durasolv is a second-generation patented technology that was developed to produce robust MDTs. Durasolv has much higher mechanical strength than Orasolv due to use of higher compaction pressure during compression. Thus, it is produced in a much faster and cost-effective manner and can be packed in either traditional blister packs or vials. The limitations of Durasolv is its low drug loading capacity and high compaction pressure which are not suitable for incorporation of taste masked coated pellets. Wowtab is a patented technology developed in Japan. This technique has been used in the production of Benadryl Fast melt tablets. In this technology, two different types of saccharides are combined to obtain a tablet formulation with adequate hardness and fast dissolution rate. Due to its significant hardness, the WOWTAB formulation is more stable to the environmental conditions than the Zydis or Orasolv and is suitable for both conventional bottle and blister packaging. The taste-masking technology utilized in the WOWTAB is proprietary and claims to offer superior mouth feel due to the patented smooth-melt action. [Table 1] depicts some patented products of CIMA Labs that are currently available in market. Table 1: Currently marketed intraorally disintegrating tablets manufactured by Cima Labs, Inc. When tablet ingredients are sensitive to moisture or are unable to withstand elevated temperature during drying, and when the tablet ingredients have sufficient inherent binding or cohesive properties, slugging may be used to form granules. This method is referred to as dry granulation, precompression, or double compression. Spray drying was used for the preparation of the microspheres. Spray drying is widely used in pharmaceutical processing because it requires only a one-step process and can be easily controlled and scaled up. , Spray drying is widely used in pharmaceutical and biochemical fields and the final particle size is controlled by a number of factors including the size of the nozzle used in the processing. [Figure 3] illustrates various steps involved in spray-drying process. 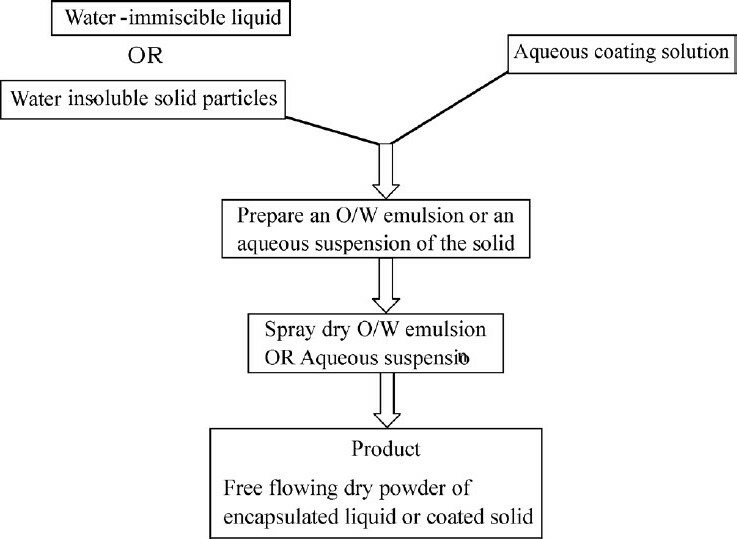 Figure 3: Flow chart for spray- dry process of coating liquid or solid particles. A direct compression method uses conventional equipment, commonly available excipients, and a limited number of process steps. This process may involve granulation prior to final blend. The direct compression tablet's disintegration and solubilization are based on the single or combined action of super disintegrants, water-soluble excipients, and effervescent agents. Tizanidine HCl,  Oxybutynin HCl,  Rofecoxib,  and Ethenzamide  are some examples of model drugs that have been formulated as FDT by direct compression method. The choice of superdisintegrant for a tablet formulation depends largely on the nature of the drug being used. For example, the solubility of the drug component could affect the rate and mechanism of tablet disintegration. Water-soluble materials tend to dissolve rather than disintegrate, while insoluble materials generally tend to disintegrate if an appropriate amount of disintegrant is included in the formulation. [Table 2] shows some disintegrants and superdisintegrants used by various researchers to formulate FDTs. The time for disintegration of ODTs is generally <1 minute and actual disintegration time that patient can experience ranges from 5 to 30 seconds. The standard procedure of performing disintegration test for these dosage forms has several limitations and they do not suffice the measurement of very short disintegration times. The disintegration test for ODT should mimic disintegration in mouth within salivary contents. Various disintegration methods developed are discussed in [Table 4]. The development of dissolution methods for ODTs is comparable with the approach taken for conventional tablets and is practically identical. Dissolution conditions for drugs listed in a pharmacopoeia monograph, is a good place to start with scouting runs for a bioequivalent ODT. Other media such as 0.1N HCl and buffers (pH - 4.5 and 6.8) should be evaluated for ODT much in the same way as conventional tablets. USP dissolution apparatus 1 and 2 can be used. USP 1 Basket apparatus may have certain applications, but sometimes, tablet fragments or disintegrated tablet masses may become trapped on the inside top of the basket at the spindle where little or no effective stirring occurs, yielding irreproducible dissolution profiles. Kancke  proposed USP 2 Paddle apparatus, which is the most suitable and common choice for ODTs, with a paddle speed of 50 rpm commonly used. Typically, the dissolution of ODT is very fast when using USP monograph conditions; hence, slower paddle speeds may be utilized to obtain a profile. The tablets manufactured are compressed at a low hardness that promotes fast disintegration. 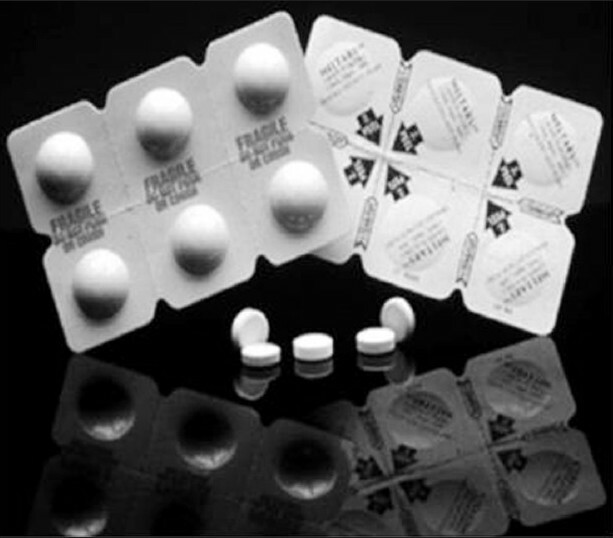 The dosage forms need to be packaged in foil-foil aluminum blisters with a dome shape that impact physical protection and impermeability to moisture. This constitutes the PakSolv Technology. Tablets manufactured with DuraSolv technology contain a non-directly compressible filler and a lubricant. They may or may not contain effervescence, and the drug need not be taste masked. DuraSolv tablets are compressed at higher hardness compared with OraSolv that allows for packaging in bottles or push through blisters. The advantages of tablet-based technology include low cost of goods, standard manufacturing technology, standard packaging format and materials, and low development costs and risks. Disadvantages include slightly longer disintegration time. Yamanouchi Pharmaceutical Co. Ltd., Japan, has developed and commercialized a quick-disintegrating "Without Water Tablet" (WOWTAB® ) technology. WOWTAB® is a tablet that has sufficient hardness to maintain physical and mechanical integrity of the dosage form prior to contact with saliva. WOWTAB® consists of commonly used tablet excipients which are Generally Recognized As Safe (GRAS) materials. WOWTAB® when placed in the mouth rapidly becomes soft by absorption of saliva and disintegrates or dissolves within 15 to 20 seconds. WOWTAB® disintegrates or dissolves more quickly when pressure between the upper jaw and tongue or a licking movement is applied to the tablets. WOWTAB® is manufactured using conventional granulators, tablet machines, and packaging equipment, which ensure excellent drug content uniformity and batch-to-batch reproducibility. WOWTAB® tablets are produced by a standard tablet compression molding process. WOWTAB tablets are developed by Yamanouchi Pharma Technologies. The main ingredients in the tablets include low- and high-moldable sugars. The low-moldable sugars promote quick dissolution and include mannitol, lactose, and glucose. High-moldable sugars promote good hardness upon compaction and include maltose, sorbitol, and maltitol. The active and other excipients are granulated with a solution containing both the sugars in a fluid-bed granulator. The granules obtained are blended with lubricants and flavors and then compressed to form tablets. The tablets are then stored in a controlled humidity and temperature system for conditioning and then packaged in blisters or bottles. Taste masking of the active may be achieved by the use of cyclodextrins. Flashtab tablet matrix consists of a swellable agent (modified starch or MCC) and a super disintegrant (crospovidone or croscarmellose). The system may also contain, depending on the need, a highly water-soluble polyol with binding properties such as mannitol, sorbitol, maltitol, or xylitol, instead of the swellable agent as mentioned before. The active is taste masked by direct coating. Tablets manufactured using this technology produce durable tablets in which the excipients are first granulated using wet or dry granulation process, then the coated drug is mixed with the excipient granules and compressed into tablets that can be handled and packaged using conventional processing equipment. Tablets for blister packaging can withstand the pressure used to push the tablet out of the lidding foil of the blister card. Tablets containing hygroscopic material can also be blister packaged, by using high-quality polyvinyl chloride or aluminum foils, which provide a higher degree of moisture protection than ordinary polyvinyl chloride or polypropylene foils. Eurand is the owner of Advatab drug delivery system. Eurand is known for its Microcaps_ technology, which involve taste-masking drug particles using microencapsulation process based on coacervation/phase separation technique. Eurand applied Microcaps technology to design ODTs (Advatab), which contains taste-masked active ingredients. The primary ingredients in the dosage form include sugar alcohols and saccharide with particle size less than 30 mm along with disintegrant and lubricant. The lubricant used in the formulation is added as an external lubricant compared with conventional formulations, which contain an internal lubricant. The company claims that this allows the tablets to be stronger compared with conventional tablets as internal lubricants are hypothesized to decrease binding of the drug particles. The dosage forms are manufactured using conventional tabletting and packaging equipments. The tablets, which can handle high drug loading and coated particles, can be packed in both bottles and pushed through blisters. Akina owns Frosta technology. The technology incorporates manufacture of highly plastic granules using a plastic material, a material enhancing water penetration, and a wet binder. These granules can then be compressed into tablets at low pressure, thus enabling fast disintegration upon administration. Lyoc technology is owned by Cephalon Corporation. CIMA is a subsidiary of Cephalon, and currently manages the Lyoc RandD efforts. This was the first freeze-drying-based technology introduced for ODTs. The process involves preparation of a liquid solution or suspension of the drug-containing fillers, thickening agents, surfactants, non-volatile flavoring agents, and sweeteners. This homogenous liquid is then deposited in blister cavities and subjected to freeze drying. Advantages of Lyoc compared with other freeze-dried dosage forms include absence of preservatives. [Table 5] and [Table 6] shows various patented technologies and drugs formulated as FDT with their Brand names available in market. FDT products and technologies face various challenges, as listed in [Table 7]. These challenges are related to new technologies and products. As these technologies mature and new products are developed, some of these challenges will be addressed by various companies. Several technologies are used to achieve quick dispersion and drug delivery to the oral cavity. The four FDT technologies reviewed in this chapter include WOWTAB® , Zydis® , OraSolv® , and Shearform™. The formulation considerations including selection of drugs, excipients, packaging, and manufacturing process have been contrasted among these different FDT technologies. Each FDT technology has its own advantages and disadvantages but common to all are their rapid disintegration and convenience of dosing to patients. Special in vitro and in vivo test methods to study the performance of these products are required. Although FDT technology and products face many challenges as they are fairly new in the marketplace, these technologies are rapidly evolving and continue to undergo improvement which will address the future challenges and changing patient and healthcare needs. Overall, FDT products have enormous commercial potential, which will be realized in the next decade as more effective FDT products are being developed to address the unmet needs of the patients. Quick-dispersing oral drug delivery systems are defined as oral drug delivery systems that when placed in the mouth dissolve or disintegrate within a few seconds to a few minutes and do not require water to aid swallowing. The FDT dosage forms are ideal for many groups of patients including geriatrics, pediatrics, and those people who have difficulty swallowing. An important benefit of FDT dosage forms is the ability to provide the advantages of a liquid medication in the form of a solid preparation. This feature enables the patient to take the dose as directed at any time without water and inconvenience. There is clear medical need and clinical benefits provided by these technologies and products. 1. Zade PS, Kawtikwar PS, Sakarkar DM. Formulation, evaluation and optimization of fast dissolving tablet containing tizanidine hydrochloride. Inter J Pharm Tech Res 2009;1:34-42. 2. Ishikawa T, Watanabe Y, Utoquchi N, Matsumoto M. Preparation and evaluation of tablets rapidly disintegrating in saliva containing bitter-taste-masked granules by the compression method. Chem Pharm Bull 1999;47:1451-4. 3. Omaima SA, Mohammed HA, Nagia MA, Ahmed SZ. Formulation and optimization of mouth dissolve tablets containing rofecoxib solid dispersion. AAPS Pharm Sci Tech 2006;7: E1-9. 4. Simone S, Peter CS. Fast dispersible ibuprofen tablets. Eur J Pharm Sci 2002;15:295-305. 5. European Pharmacopoeia 5.0, Vol. 1.0, 5th ed, Strasbourg, France: 2005. p. 628. 6. Habib W, Khankari R, Hontz J. Fast-dissolve drug delivery systems. Crit Rev Ther Drug Carrier Syst 2000;17:61-72. 7. Li Q, Wei WX, Xiaofeng C, Tao H. Evaluation of disintegrating time of rapidly disintegrating tablets by a paddle method. Pharm Dev Tech 2006;11:295-305. 8. Vikas A, Bhavesh HK, Derek VM, Rajendra KK. Drug delivery: Fast dissolve systems. Encycl Phar Tech 2007;1:1104-14. 9. Sohi H, Sultana Y, Khar RK. 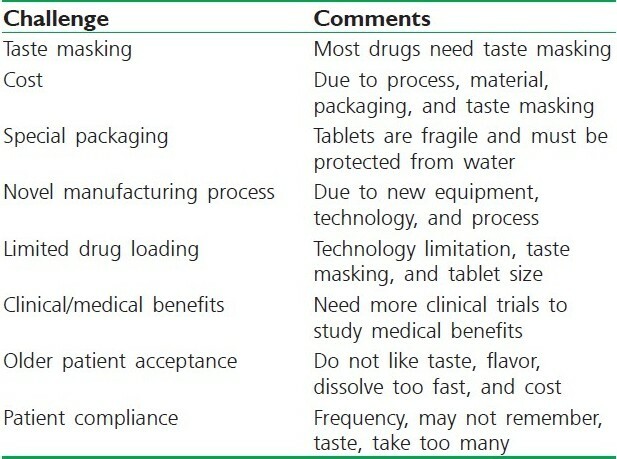 Taste masking technologies in oral pharmaceuticals: Recent developments and approaches. Drug Dev Ind Pharm 2004;30:429-48. 10. Pondell, R. Taste masking with coatings, Coating technology, 1996. 11. Zelalem A, Vibha P, Lokesh K, Arvind KB. Trends in pharmaceutical taste masking technologies: A patent review. Recent Pat Drug Deliv Formul 2009;3:26-39. 13. Szejtli J, Szente L. Elimination of bitter, disgusting tastes of drugs and foods by cyclodextrins. Eur J Pharm Biopharm 2005;61:115-25. 14. Fu Y, Yang S, Jeong SH, Kimura S, Park K. Orally fast disintegrating tablets: Developments, technologies, taste-masking and clinical studies Crit Rev Ther Drug Carrier Syst 2004;21:433-76. 15. Amidon GL, Lennernas H, Shah VP, Crison JR. Theoritical basis for a biopharmaceutics drug classification: The correlation of in vitro drug product dissolution and in vivo bioavailability. Pharm Res 1995;12:413-20. 16. Lindenberg M, Kopp S, Dressman JR. Classification of orally administered drugs on the world health organization model list of essential medicines according to the biopharmaceutical classification system. Eur J Pharm Biopharm 2004;58:265-278. 17. Sharma S, Gupta GD. Farmulation and charracterization of fast dissolving tablet of promethazine theoclate. Asian J Pharm 2008;2:70-72. 18. Dario L, Maria GB, Maria CL, Claudio JS. Development of prednisone: Polyethylene glycol 6000 fast release tablets from solid dispersion: Solid state characterization, dissolution behaviour, and formulation parameters. AAPS Pharm Sci Tech 2007;8:221-228. 19. Singh J, Philip AK, Pathak K. Optimization studies on design and evaluation of orodispersible pediatric formulation of indomethacin. AAPS Pharm Sci Tech 2008;9:60-6. 20. Marzia C, Francesca M, Giovanna C, Paola M. Fast dissolving tablets of Glyburide based on ternary solid dispersions with PEG 6000 and surfactants. Drug Deliv 2007;14:247-55. 21. Sussanne B, Margareta D, Bo L, Hans L, Anders P, Marie W, et al. In vitro and In vivo evaluation of new sublingual tablet system for rapid oromucosal absorption using fentanyl citrate as the active substance. Eur J Pharm Sci 2003;20:327-34. 22. Iman SA, Mona HA. in vitro and in vivo evaluation of a fast disintegrating lyophilized dry emulsion tablet containing Griseofulvin. Eur J Pharm Sci 2007;32:58-68. 23. Sam C, Jean PR. Formulation and Production of Rapidly Disintegrating tablets By Lyophilization Using Hydrocholorothiazide as a Model Drug. Int J Pharm 1997;152:215-25. 24. Abdelbary G, Prinderre P, Eouani C, Joachim J, Reynier JP, Piccerelle PH. The Preparation of Orally Disintegrating Tablets Using A Hydrophilic Waxy Binder. Int J Pharm 2004;278:423-33. 25. Raguia AS, Iman SA, Rehab NS. In vitro and In vivo evaluation of nimesulide lyophilized orally disintegrating tablets. Eur J Pharm Biopharm 2009;73:162-71. 26. Verley P, Yarwood R. Zydis-a novel fast dissolving dosage form. Manuf Chem 1990;61:36-7. 28. Segar H. Drug delivery products and the Zydis fast dissolving dosage. J Pharm Pharmacol 1998;50:375-83. 29. Corveleyn S, Remon J. Formulation of a lyophilised dry emulsion tablet for the delivery of poorly soluble drugs. Int J Pharm 1998;166:65-74. 30. Chandrasekhar R, Hassan Z, AlHusban F, Smith A, Mohammed A. The role of formulation excipients in the development of lyophilized fast-disintegrating tablets. Eur J Pharm Biopharm 2009;72:119-29. 31. Carstensen JT. Pharmaceutics of Solids and Solid Dosage Forms, New York: Wiley Interscience; 1977. p.11-5. 33. Chang RK, Guo X, Burnside BA, Couch RA. Fast-dissolving tablets. Pharm Technol N Am 2000;24:52-8. 35. Green R, Kearney P. Process for preparing fast dispersing solid dosage form. US Patent 5,976,577,Nov 2, 1999. 36. Lawrence J, Posage G. Bicovex rapidly disintegrating dosage form. US Patent 6,224,905, Dec 3, 1998. 37. Simone S, Peter CS. Fast dispersing ibuprofen tablets. Eur J Pharm Sci 2002;15:295-305. 38. Katzner L, Jones B, Khattar J, Kosewick J. Blister package and packaged tablet. US Patent 6,155,423, December 5, 2000. 39. Jaccard TT, Leyder J. A new galenic form: lyoc, Ann Pharm Fr 1985;43:123-31. 40. Lafon L. Galenic form for oral administration and its method of preparation by lyophilization of an oil-in-water emulsion, US Patent 4616047, Oct 7, 1986. 41. Gole D, Savall T, fu GL, Dale W, Paul K, Davies JD. Tastemasked resinate and preparation thereof, US Patent application 20050036977. Feb 17, 2005. 42. Iles MC, Atherton AD, Copping NM. Freeze-dried dosage forms and methods for preparing the same, US Patent 5,188,825. Feb 23, 1993. 43. Ford J. The current status of solid dispersion. Pharm Acta Helv 1986;61:69-88. 44. Dobetti L. Fast melting tablets: Developments and technologies. Pharm Technol Drug Deliv 2001;(Suppl):44-50. 45. Suresh B, Rajendar KM, Ramesh G, Yamsani MR. Orodispersible tablets: An overview. Asian J Pharm 2008;2:2-11. 46. Bi Y, Sunada H, Yorinobu Y, Danjo K, Otsuka A, Iida K. Preparation and evaluation of a compressed tablet rapidly disintegrating in the oral cavity. Chem Pharm Bull 1996;44:2121-7. 47. Watanabe Y, Koizumi K, Zama Y, Kiriyama M, Matsumoto Y, Matsumoto M. New compressed tablet rapidly disintegrating in saliva in the mouth using crystalline cellulose and a disintegrant. Biol Pharm Bull 1995;18:1308-10. 48. Bi Y, Yorinobu Y, Sunada H. Rapidly disintegrating tablets prepared by wet compression method: Mechanism and optimization. J Pharm Sci 1999;88:1004-10. 49. Sunada H, Bi Y. Preparation, evaluation and optimization of rapidly disintegrating tablets. Powder Technol 2002;122:188-98. 50. Di CM. Flashtab and T-Mask Technologies, Paper presented at: Proceedings of the 7th International Glatt Symposium 1997;1-9. 51. Cousin G, Bruna E, Gendrot E. Rapidly disintegratable multiparticulate tablet, US Patent 5,464, 632., Nov 7, 1995. 52. Khankari R, Hontz J, Chastain S, Katzner L. Rapidly dissolving robust dosage form. US Patent 6,024,981, February 15, 2000. 53. CIMA LABS Inc., "Easy-to-take orally disintegrating tablets", available from: http://www.cimalabs.com/orally-disintegratingtablets. [Last cited on 2011 Jun 30]. 54. Chang RK, Xiaodi B, Beth A, Couch RA. Fast-dissolving tablets. Pharm Technol 2000;24:52-8. 55. Yamanouchi Pharma Technologies, Inc. WOWTAB, available from: http://www.imagesrising.com [Last cited on 2011 Jun 30]. 56. Pather SI, Khankari R, Siebert J. "Quick-dissolving intraoral tablets" in Drug Delivery to the Oral Cavity: Molecules to Market, In: Ghosh TK, Pfister WR, Editors. New York, NY: CRC Press; 2005. p. 291-310. 57. Bytul MR, Mir Imam IW, Proma K, Maruf A, Robiul I, Ranjan KB, et al. Effect of starch 1500 as a binder and disintegrant in lamivudine tablets prepared by high shear wet granulation. Pak J Pharm Sci 2008;21:455-9. 58. Madhu KV. Coprecipitates and Melts. In: Swarbrick J, Boylen JC, Editors. ′Encyclopedia of Pharmaceutical Technology′, Vol. 1, 3rd ed, Pinehurst, North California, USA: Pharmaceutics Inc. 2007.p. 774-81. 59. Giunchedi P, Conti B, Genta I, Conte U, Puglisi G. Emulsion spray drying for the preparation of albumin-loaded PLGA microspheres. Drug Dev India Pharm 2001;27:745-50. 60. Alysson LR, Wanderley PO. Spray drying conditions and encapsulating composition effects on formation and properties of sodium diclofenac microparticles. Powder Technol 2007;171:7-14. 61. Donald LW. Handbook of Pharmaceutical Controlled Release Technology, 1st ed, New York: Marcel Dekker Inc.; 2005. p. 112-3. 62. Lieberman HA, Lachman L, Schwartz JB. Pharmaceutical Dosage Forms: Tablets, 2nd ed, Vol. 3, New York: Marcel Dekker Inc; 2005. p. 187. 63. Allen LV, Wang B. Process for making a Particulate Support Matrix for Making a Rapidly Dissolving Dosage Form. US Patent 6,207,199; 2001. 64. Allen LV, Wang B. Process for making a Particulate Support Matrix for Making a Rapidly Dissolving Tablet. US Patent 5,587,180, 1996. 65. Allen LV, Wang B, Davis LD. Rapidly Dissolving Tablet. US Patent 5,807,576; 1998. 66. Jianchen X, Li LB, Kang Z. Taste masking microspheres for orally disintegrating tablets. Int J Pharm 2008;359:63-9. 67. Honey G, Parshuram R, Vikas R, Ashok KT. Orally disintegrating systems: Innovations in formulation and technology. Recent Pat Drug Deliv Formul 2008;2:258-74. 68. Misra TK, Currington JW, Montwill BK, Satish V, Sanghvi PP, Sisak JR, et al. US20006048541 2000. 69. Roser BJ, Blair J. Rapidly soluble oral dosage forms, methods of making same, and composition thereof. US Patent 5,762,961, June 9, 1998. 70. Jinichi F, Etsuo Y, Yasuo Y, Katsuhide T. Evaluation of rapidly disintegrating tablets containing glycine and carboxymethylcellulose. Int J Pharm 2006;310:101-9. 71. Johnson JR, Wang LH, Gordon MS, Chowhan ZT. Effect of formulation solubility and hygroscopicity on disintegrating efficiency in tablets prepared by wet granulation. J Pharm Sci 1991;80:469-71. 72. Anand V, Kandarapu R, Garg S. Preparation and evaluation of taste-masked orally disintegrating tablets of prednisolone. Asian J Pharm Sci 2007;2:227-38. 73. Sumitha C, Karuna SN, Divya B, Madhavi K, Vimal KV, Charbe NN. Taste masking of ondansetron hydrochloride by polymer carrier system and formulation of rapid-disintegrating films, Int J Chem Res 2009;1:24-7. 74. Koizumi K, Watanable Y, Morita K, Utoguchi N, Matsumoto M. New Method of preparing high-porosity rapidly saliva soluble compressed tablets using mannitol with camphor: A subliming material. Int J Pharm 1997;152:127-31. 75. Adjei A, Doyle R, Reiland T, Swarbrick J, Boylan JC. Editors. Encyclopedia of Pharmaceutical Technology, Vol. 6, New York: Marcel Dekker; 1992. p. 117. 76. Billany MR, Aulton ME. Ediotrs; Pharmaceutics; The science of Dosage form Design, International Edition, New York: Churchill Livingstone; 1996. p. 263. 77. Catania JS, Johnson AD. U. S. Patent 5633006, 1997. 78. Nelson SL. U.S. Patent 5766622, 1998. 79. Eby III, Georage A. U.S. Patent 5002970, 1991. 80. Pandya HB, Callan TP. U.S. Patent 5.837, 286, 1998. 81. Chang RK, Guo X, Burnside B, Couch R. Fast-dissolving tablets. Pharm Technol 2000;24:52-8. 82. Morella AM, Pitman IH, Heinicke GW. Taste masked liquid suspensions. US Patent 6,197,348. 2001. 83. Tian W, Langride J. Fast dissolving and taste masked oral dosage form comprising sildenafil. Patent WO2004017976. 2004. 84. Corbo M, Desai J, Patell M. U.S. Patent 6.663.893, 2003. 85. Friend DR, Steve N, Sarabia RF, Weber TP, Geoffory J. U.S. Patent, 6, 139.865, 2000. 86. Augello M, Dell SM, Reier GE, Stamato HJ, DiMemmo LM. U.S. Patent, 6099.865, 2000. 87. Kato M. Japan Patent, 8259466, 1996. 88. Maccari M, Calanchi M, Kydonieus AF. Editors; Controlled Release Technologies, Methods, Theory and Applications, 1st edition, Vol. 2, Boca, Raton, Florida: CRS Press, Incl; 1980. p. 113. 89. Narazaki R, Harada T, Takami N, Kato Y, Ohwaki T. A new method for disintegration studies for Rapid Disintegrating Tablet. Chem Pharm Bull 2004;52:704-7. 90. Fu Y, Jeong SH, Park K. Preparation of Fast Dissolving Tablets Based on Mannose. Polym Mater Sci Eng Preprint 2003;89:821-2. 91. Dor PJ, Fix JA. In vitro determination of disintegration time of quick- dissolving tablets using a new method. Pharm Dev Technol 2002;7:361-71. 92. Mortia Y, Tsushima Y, Yasui M, Termoz R, Ajioka J, Takayama K. Evaluation of the disintegration time of rapidly disintegrating tablets via a novel method utilizing a CCD camera. Chem Pharm Bull 2002;50:1181-6. 93. Kancke J. Dissolution testing of orally disintegrating tablets. Disso Tech 2003;10:6-8. 94. Wehling F, Schuehle S, Madamala N. Effervescent dosage form with microparticles. US Patent 5,178,878, January 12, 1993. 95. Yamanouchi Pharmaceutical Co. Press release: Open Yamanouchi Shaklee Pharma Research Center at Stanford Research Park, November 24, 1997. 96. Mizumoto T, Masuda Y, Fukui M. Intrabuccally dissolving compressed molding and production process thereof. U.S. Patent 5,576,014. November 19, 1996. 97. Mizumoto T, Masuda Y, Fukui M. Intrabuccally dissolving compressed moldings and production process thereof. US Patent 5,576,014, November 19, 1996. 98. Pebley WS, Jager NE, Thompson SJ. Rapidly Disintegrating Tablets. US Patent 5,298,261, March 29, 1994. 99. Cremer K. Fast dissolving technologies in detail: Orally disintegrating dosage forms. Pharma Concepts, Humberg, Germany, GmbH and Co. KG; 2001. p. 62-97. 100. Jeong SH, Fu Y, Park K. Frosta: A new technology for making fast-melting tablets. 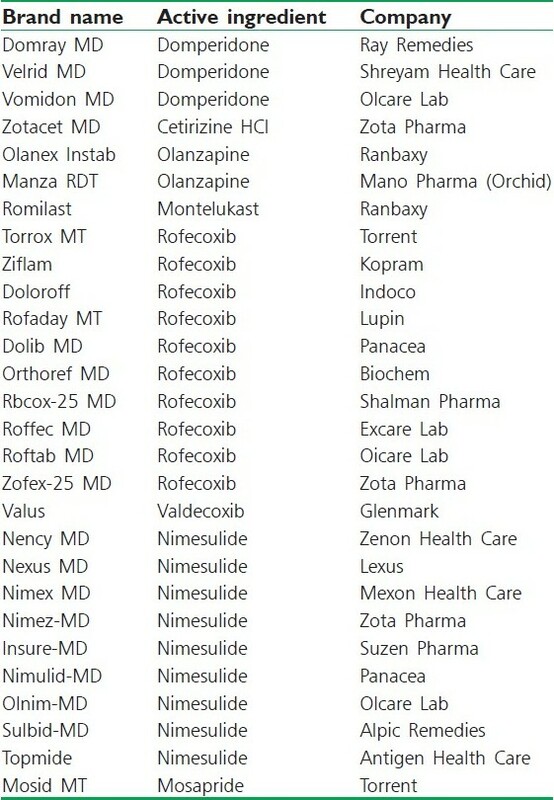 Expert Opin Drug Deliv 2005;2:1107-16. 101. Laboratoire L. Galenic form for oral administration and its method of preparation by lyophilization of an oil-in-water emulsion. Eur Pat 0,159,237,1985. 102. Kovacic M, Milovac J, Cvelbar P, Stalc A, TrostZ, Kopitar Z. Dispersible cimetidine tablets. US Patent 5,069,910; 1991. 103. Fu Y, Yang S, Jeong SH, Kimura S, Park K. Orally fast disintegrating tablets: Developments, technologies, taste-masking and clinical studies. Crit Rev Ther Drug Carrier Sys 2004;21:433-76. 104. Sharma K, Pfister WR, Ghosh TK. "Quick-dispersing oral drug delivery systems" in Drug Delivery to the Oral Cavity: Molecules to Market, In: Ghosh TK, Pfister WR, Editors. New York, NY: CRC Press; 2005. p. 261-90. Vummaneni, V. and Nagpal, D.
Liu, Z. and Pan, F. and Shi, Y.